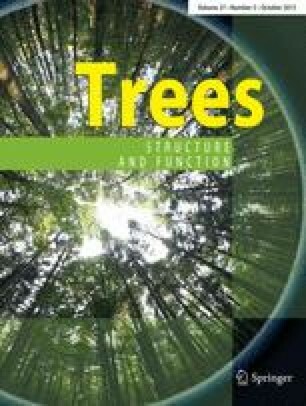 Changes in age of the hydraulic architecture of Ulmus minor and U. minor × U. pumila juvenile wood were studied and related to tolerance to Dutch elm disease (DED). The xylem vessel dimensions and the conductivity to air of 2- to 7-year-old branches were analyzed and quantified. No obvious differences in vessel length distribution and conductivity were found to explain differences in DED tolerance among the U. minor clones, or, at the taxon level, the higher DED tolerance of U. minor × U. pumila. Among the U. minor clones, the more susceptible one had wider vessels and a higher maximum vessel diameter than the more tolerant clone. Relations between vessel lengths, vessel diameters and branch sizes were highly significant, and varied between taxa. The diameter and length of vessels increased with age, and average values stabilized 1–2 years earlier for U. minor than for U. minor × pumila. Mean maximum vessel length was significantly higher in U. minor and increased more with age and maximum vessel diameter than in U. minor × pumila. With each 0.2 m increase in height up the stem, conductivities for U. minor and U. minor × U. pumila decreased by 59 and 50 %, respectively, probably due to shortening of the vessels. The implications of xylem structure for the means of pathogen movement and resistance to DED are discussed. The authors wish to thank Margarita Burón and David López for their technical support, and to Jane McGrath for the language editing. This study was conducted within the framework of an agreement between DGMN and PF (Ministerio de Agricultura, Alimentación y Medio Ambiente) and ETSI Montes (Universidad Politécnica de Madrid).